We Can Fix Your iPhone Battery Problems! 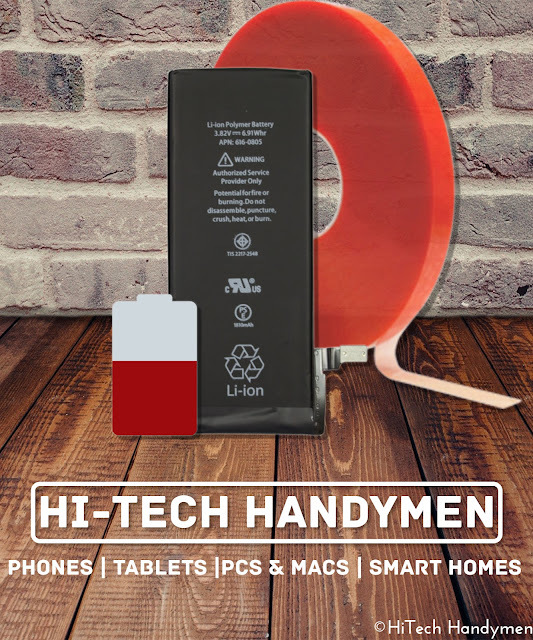 Hello, this is HiTech Handymen here with our first blog post! If you aren't in the loop, Apple itself offers $29 battery replacements due to the miscommunication of how iPhones are throttling speeds due to degraded batteries. Essentially, Apple did not do well to communicate that the reason behind this change was to prevent phones from suddenly shutting down. In particular, the iPhone 6S line has had known problems suddenly shutting down. Basically, the iPhones 6S shuts down because the degraded battery is attempting to deliver more voltage than it is capable of, thus shutting down the phone. So, to alleviate this problem without preemptively offering battery replacements, Apple has decided to simply throttling the speed of the CPU (the brains in your phone) to reduce the required voltage levels so that the phone can stay on with a degraded battery. This, incidentally is very similar to how Samsung reacted to their own battery debacle with the Note 7. Though, with Samsung, they simply decided to limit how much Note 7 batteries can be charged by. Ok, so back to this whole iPhone battery thing....so you can see why they decided to offer $29 battery replacements for iPhone 6 and higher? Yep, because people were now complaining that their phone were acting slow after a while. And Apple didn't communicate this well to the customers. There's reason to be angry. But now, you're wondering, "Great, so I can go ahead and get my battery replaced by Apple for just $29!". As you may have imagined, Apple Genius Bars are now overloaded with people who want to do the iPhone Battery Replacements and for some reason won't have them in constant stock until later this year. Boo. Extremely fast battery replacements for most iPhones, usually in 10 minutes or less! Apple will usually take much longer. Local right here in Chapel Hill, or we can come to you. Just let us know which model iPhone you have so we can prepare! Supporting us in our quest to continuously offer low-priced cell phone repairs to everyone in Chapel Hill! Don't need any appointments to change battery, just come on in anytime during our business hours! Thank you and we hope to be of service to your gadgets soon!